This model has been discontinued. Click here to see other Coffee Makers & Pots. A perfect choice whenever you're serving an office, a lunch line or simply a large family. 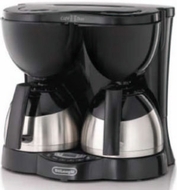 With it's Dual Drip function, this commercially rated coffee maker will do the work of two regular ones in the same time. BRUSHED STAINLESS STEEL DOUBLE-WALL THERMAL CARAFE is a unique design that retains heat, keeping coffee hot for hours. It also helps to preserve that fresh coffee taste. DIGITAL PROGRAMMABLE TIMER WITH BREW AUTO SHUT-OFF is convenient and easy-to-use. Just set the timer the night before, so you can wake up to the smell of fresh-brewed coffee. SWING-AWAY FILTER BASKETS WITH PERMANENT PLATINUM FILTERS. Just swing-open the filter basket for quick removal of the filters. DUAL DRIP FUNCTION. It's like having two coffee makers in one! The dual carafes can be operated simultaneously or independently with separate timer and on/off functions. 3 COLOR-CODED LIDS INCLUDED. Orange for decaf, red for hot water and brown for flavored coffee. DECALCIFICATION SYSTEM. Automatic decalcification indicator lets you know when it's time to clean the machine. SHOWER HEAD DESIGN helps to extract your coffee's full, natural flavor by allowing water to fully saturate coffee grounds. NON-STICK PLATES make cleanup a fast and simple. COMMERCIALLY RATED. UL rated for commercial and household use.